Shoyu pork (The Cat calls it hong shao rou, or “red cooked meat (pork)”) is one of The Cat’s favorite foods from Shanghai. It is a home dish with as many variations as there are cooks (see http://www.redcook.net/2008/01/18/hong-shao-rou-red-cooked-pork/). Pork, traditionally belly pork. 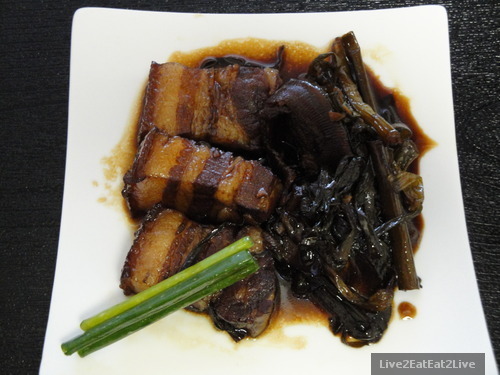 I think part of the attraction to shoyu pork is the texture, taste, and richness that only belly pork contains. Shoyu, or soy sauce. It seems that to achieve the taste that The Cat remembers, Chinese dark soy sauce has to be used. The Cat has tried shoyu pork made with other types of soy sauce, but it wasn’t the same. Sugar, about two to three tablespoons. Ginger, about an inch or two. Chinese cooking wine, we used the Shao Xing variety. Dried shiitake mushrooms, sliced and rehydrated. Green onions, as much or as little as desired. Pinch of salt, it seems counterintuitive because of the shoyu, but several recipes include it, and it seems to work. The pork is browned, then braised in the other ingredients until soft and tender (about 50 minutes). The green onions softened and with the mushrooms, absorbed the flavors of the pork and sauce. The green onions and mushrooms were my favorite part of the dish (although the pork was tasty too). It reminded me of collard greens cooked with ham hock, bacon, or salt pork that we had at a barbecue once. The pork had a good balance of meat and fat. The meat was tender and blended with the fat to melt in the mouth. This was served with rice. The next challenge is to make shoyu pork to rival the one’s made in Shanghai. Wish me luck. The Mouse can cook indeed! I love this one! That pork belly looks absolutely scrumptious! Good luck! Thanks for stopping by. Eat well. Hmm I’ve never used mushroom in this dish before – will give it a go next time! Try add 2 whole star anise to your recipe. It give that extra bit of fragrance and sweetness.